Pioneers in the industry, we offer double rotary tableting machine, double sided rotary tablet press, double sided tablet press machine, double sided high speed tablet press, double sided rotary tableting machine and double sided rotary tablet press machine from India. Machine Construction is of rugged design with turret made of highly ductile SG Iron casting. Very rigid gun metal Feed Frame (both identical) with sufficient height to avoid spill over of powder. Turret rotates on needle roller thrust bearing which is immersed in oil for frictionless rotation. Specially designed 3 piece (on demand) Turret has been developed to avoid crack between die holes especially for 33, 35, 41 & 45 stn machines. We are engaged in manufacturing a wide range of High-Speed Double Sided Rotary Tablet Press. Our press has double sided lifting cams and available with AC variable drive & electromagnetic clutch and with two-layer tablets attachment. Our entire range of machines is largely acknowledged for their high functionality, robust construction and ease operations. Backed by rich industry experience, we have been able to offer Double Sided High Speed Tablet Press machine to our reputed clients. 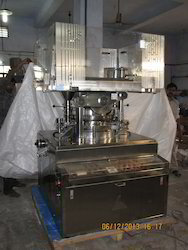 These machines are manufactured following with international standard keeping in mind requirements of our clients. 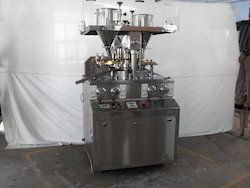 These High-Speed Double Sided Rotary Tablet Press machine are available at the market competitive price. Internal helical gear ring and pinion drive for the smooth running of the machine. ACVF drive for the main motor & also ACVF drive for feeder motors. Heavy duty advance design of overload compression spring system, eliminates hydraulic cylinders & accumulator cylinder. No maintenance of hydraulic cylinder & accumulator cylinder. Continuous lubrication pump for turret helical gear & pinion. Lower punch seals in the turret. 3 types of filling cams. Round hopper with butter fly valve. which facilitates easy cleaning of the machine. Throe piece turret with stainless steel 304/316 die-table. Powder level monitoring device at feed hoppers. Spray lubrication system for effervescent table production. Plc control system with touch screen display. Press suitable for large batch production. Conforming to stringent cGMP norms. All Tablet parameters can be fine tuned during operation from outside the tableting zone. 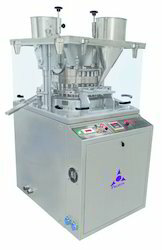 This Machine is available with Pre-compression Roller. 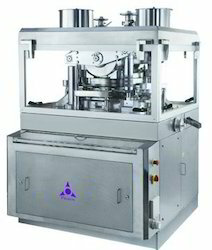 Ability to compress variety of products easily. ACVF drive for main motor. AC variable drive for force feeder motors. Easy accessibility for quick cleaning and product change over. Precise weight control by calibrated SIEKO dials. 3 Types of filling lower cam track is provided with machine. All Upper guards and side guard interlock provided for operator safety. Ensures hygienic production condition and operator safety. Auto tablet rejection on machine start/stop. SS 316/SS 304 middle plate in turret. Electroless nickel plating on turret. 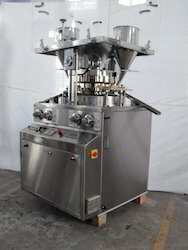 Spray lubrication system for effervescent tablet production. Double Sided Rotary Tableting Machine for Food Industry offered by us are highly appreciated by our industry experts. It has various unique technical quality as imported needle roller bearing provided at the bottom of turret and reverse direction motion protection is provided to avoid accident. 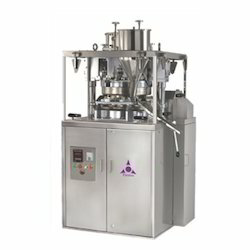 These machine are manufactured keeping in mind multiple requirement of our clients. 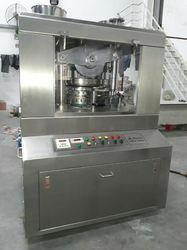 We offer a quality range of Double Sided Rotary Tablet Press Machine (Square GMP Model) to our reputed clients. This products are manufacture in our manufacturing unit under the supervision of our expert personnel. We make use of premium grade raw materials for making our range of tablet press. Our range of double sided rotary tablet press is greatly admired by our clients for its sturdy construction, superior quality and durability features. Backed by rich industry experience we are offering Double Sided Rotary Tableting Machine to our clients. It has various unique technical quality as imported needle roller bearing provided at the bottom of turret and reverse direction motion protection is provided to avoid accident. Double Sided Rotary Tableting Machine offered by us are available at very reasonable price.